Smart Brief recently released some results from a survey that asked corporate leaders how they view social media today. The results are not surprising. And yet, they are surprising. What's Not Surprising About The Smart Brief Survey. • 83 percent say that social media gives them a window into what their customers think. • 75 percent say they were either knowledgeable or actively trying to learn about social media. 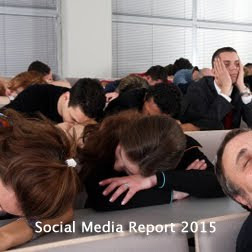 • 63 percent say that social media is not a fad, but is very "over-hyped." • 55 percent say that social media is not a waste of time. • 51 percent say their companies are actively using and exploring social media. • 40 percent fear that they are are falling behind their competitors because of social media. What's Surprising About The Smart Brief Survey. • About 70 percent say they were either knowledgeable (55%) or actively trying to learn about social media. • About 60 percent say that social media is not a fad, but is "over-hyped." • About 55 percent say that social media is a waste of time. • About 50 percent say their companies are actively using and exploring social media. • About 40 percent fear that they are falling behind their competitors because of social media. *In some cases, we had to adjust the prevalent buzz words of the day to match the statistical data, e.g., "blogs" or "new media" or "social networking" since social media had yet to be adopted as a buzz word. Also, listening wasn't even on the radar, back then. There are only a few explanations for such a chronic state of sameness: the original surveys skewed toward people already using social media (new users are most likely to answer surveys), people generally lied about adoption for fear of looking like they are falling behind, or perhaps there is something else missing from the state of social media. Given our research back in time to 2005 revealed the same blog headlines we read today — such as "is social networking replacing SEO" and "Is social media a fad" — we think it's a little of all three, with the third revealing something especially interesting. While this isn't scientific per se, we have noticed that different countries lean toward different social media information on this blog. The United States tends to focus on tactical tips whereas India tends to focus on strategic solutions. The United Kingdom tends to focus on predictions to determine what's next whereas the Netherlands tends to focus on research to determine what's most recent. The Philippines, on the other hand, tends to focus on pop culture tie-ins, which means they probably have more fun. Why is this interesting? It might suggest where different cultures are focusing their energies. And if there is any validity to tracking topics of interest, it certainly foreshadows why different countries will end up in very different places five years from now, with the U.S. currently demonstrating a healthy appetite for sameness.